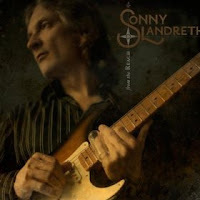 Having heard a live recording by Landreth, I knew him to be a fairly good electric slide guitarist, with a popular following primarily in his home State of Louisiana. He's probably considered a blues guitarist at the core, but he isn't limited to that genre. This CD caught my interest as a couple of other guitarists I like contributed, Mark Knopfler and Eric Clapton. All but one song is accompanied by other guests, including Robben Ford, Vince Gill, Dr. John, Eric Johnson and others. Rather than a "duet" type approach, Landreth attempted to write songs that would fit the style of each of his guests, which seems a solid approach, though the implication that others' collaborations don't find material to suit is flawed. The first track shows both the good and the bad that mars this set. It starts with "Blue Tarp Blues," which includes the required political commentary on the New Orleans flood debacle, but it also features a very energetic lead guitar from Knopfler, which hasn't been heard from him in years. Though given his own solo space, Knopfler's guitar is not as clearly heard in the mix, and his vocals are very faint. A part of the limitation is Landreth himself. While he can pronunciate extremely clearly, his voice does not carry much in the way of warmth or notable range, though quite passable. His guitar work, on the other hand, is splendid, and, rightfully, it is the "voice" that is featured throughout. So, with some artists who are fairly well known for their voices, it's curious that their contributions are lost in the mix. Knopfler and Clapton both sing, for example, but they may as well not have. Dr. John's vocals are limited to flourishes at the end of stanzas, a waste of a singer who is prevented from adding his substantial presence. Jimmy Buffet is credited for backing vocals on the same song, but he may as well have been mixing a Margarita. Yet, Landreth's voice is heard clearly above them all. It's his CD and he's entitled to it, but the result is that any sense of spontaneity and mutual inspiration in the studio is absent. The other performances may have been mailed in, which is actually a fairly common practice. There are redeeming aspects. Lyrically, Landreth is a good writer. Examples include the hopeful: "So here's a toast with one last pour to last forever and a minute more. May fortune sing to you her song, to live and love way past long." And the less hopeful: "There's a downward turn into fearful hollows, where hope stalls and faith can't follow. In the wee hours that seed the dark, the only thing that grows is us apart." The other redeeming aspect of the CD remains the guitar work, which is energetic and often soaring. That is enough to keep it my rotation. It's just disappointing that, either due to production judgment or a desire to keep his own voice front and center, the disc doesn't deliver on its stated goals. Recommended tracks: "Way Past Long," "Let it Fly," "Storm of Worry"